At first glance, this sounds unusual, but the frame is an important part of the work, complementing his composition and giving it completeness. How to make a frame for a photo yourself? If you are looking for a solution Scanner Answer to the question: "Frame made of cardboard, A word of eight letters ", then you must know that this word is used for the passepartout. This French term is called cardboard for gluing an image, or manufactured From cardboard In a special manner frame. Designed for decoration of photographs, drawings, engravings, decorative works. Passepartout or printmaking are made in specialFraming workshops. This work is simple, for its implementation, you need to have a sense of proportion and harmony, and maximum accuracy. Let's try to make a three-dimensional frame made of cardboard with our own hands. Why do you need a mat? The final stage of the creation of the workArt, decoration of decorative work or artistic photography - selection and manufacturing of the frame. The frame is an important part of the image, although it is only intended to decorate it. On how well the frame is selected, howCorresponds to her style of work, to her prisoner, it depends on what the exposed will look like. Rama is the clothes of the painting, engravings, photographs. As well as the person, that you want to show, meet on одежке. Without proper registration, the work lacks expressiveness, it will be "Naked". The purpose of the print is to create a field between the frame andImage. This field facilitates the integrity of the perception of work, enhances the aesthetic effect of the work. The monotony of the cardboard frame creates a calm atmosphere around the work, separating it from the frame decor, wall decoration, and focusing the viewer's attention on the work itself. The volume field gives the product "air", Additional depth. To confirm the importance of the print, tryTo experiment. 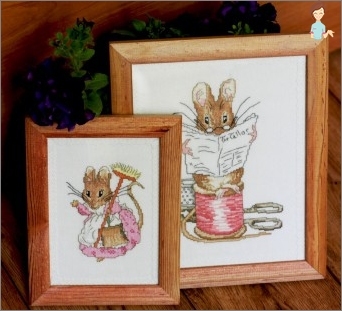 Take any image of a small format - a photo, a child's drawing, at least an illustration from a magazine, and hang it on the wall. Appreciate the impression that an image makes on you, as a spectator. Then take a sheet of white paper - ordinary, office, glue your "work" to the sheet, and hang again in the same place. Look again - it's quite another matter. This technique helps you choose the right sizeMargins of the print, the color of the cardboard, and other moments. The frame of a cardboard and paper mat may have a different texture - matte, glossy, textural. The main thing is that its color and appearance does not hamper the work being done, but, on the contrary, by its neutrality emphasizing its dignity. An auxiliary element or an independent frame? Passepartout is not always used in decorationWorks of art. Sometimes the decorative design consists only of a frame. In some cases, the frame molding has a profile that mimics the presence of a mat. If, after all, the frame has a mat, as a rule,This design is more expressive. The cardboard frame occupies a boundary position: on the one hand, it refers to the frame, and on the other hand, it begins to be perceived as part of the image. 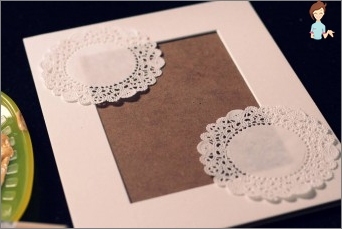 The frame itself made of cardboard can act as aSelf-framing for photographs, small engravings or drawings, embroidery, etc. 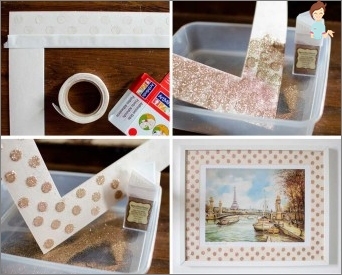 Make a simple frame of cardboard, as everyone knows, is easy. 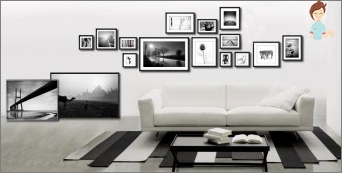 But this addition will not only beautify your favorite photo, but also make it expressive. Let's see, a master class on making frames for a personal photo of cardboard with their own hands. A knife, a ruler, a cutting mat, spatulas and palette knives, brushes, fine skins. Cut out the frame and back. You will have to choose the sizes for your work. In that master-Class we will make a frame with dimensions of 190x240 mm. Same size at the back. The width of the field is 30 mm. Hence, the window inside has dimensions of 130x180 mm. We do the mat. In this case, we will not make a real passepartout. 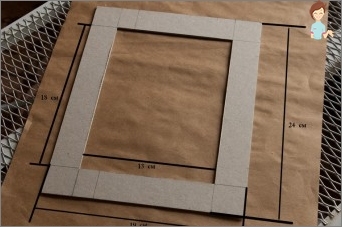 Cut out a cardboard or paper piece, which has external dimensions - the same as the frame (190h240 mm). The size of the inner window is 90x140 mm. In this frame, the image of 100x150 mm will look good. In this print, a chamfer is made around the perimeter of the window: the cardboard is cut and bent at an angle of 45 °. We, for Framing The necessary volume, we cut out another layer of white paper, with dimensions of 190x240, and the inner window is 2-3 mm smaller than that of the passepartout. In our case, this is 87x137 mm. Now we turn to the decoration of the frame. To begin with it must be primed. After the soil has completely dried, we cut off pieces of lace or an ordinary bandage (you can take both of them, depending on your desire, like Vini-Pukhu). Having decomposed the segments as you think mostDecorative, we cover the ground with decors. Apply it better with a palette knife, a thin layer. Dry it. When the workpiece dries, cut the protruding bandage, we process the edges with a sandpaper. A 3D picture is best created byStencil. For this we use a structural paste. Apply a stencil, use a palette knife to apply the paste. It is not necessary to level the surface - unevenness will give a special charm and attractive appearance to the frame. Remove the stencil gently, trying not to move the pattern. In addition, you can apply the paste in several places on the frame, as a textured plaster. Drying, sanding the edges and defects. We paint the frame according to our ideas. You can additionally add gold or bronze paints, to give vintage attrition. With the help of white paint, you can additionally paint a little and the mat to add an aged look. It is convenient to do "Dry brush"- type the paint on the very tip of the brush, the excess first erase the unnecessary paper, and then, when the paint is almost gone, paint the part. We proceed to assemble the frame. First we will connect the details to the mat. Using glue or double-sided adhesive tape, glue from the inside of the piece of white paper in such a way that the edge of the window remains a cusp in 1.5 mm. Then, on the outer edge, glue the backdrop - soSo that you can insert a photo under the mat. Also carefully glue the frame. Do not forget to make a suspension for the frame or stand. A vintage frame with your own hands made of ordinary cardboard is ready! We hope our master class will help you master the creation of original design for photographs and paintings. Enjoy your creativity and beautiful interiors!